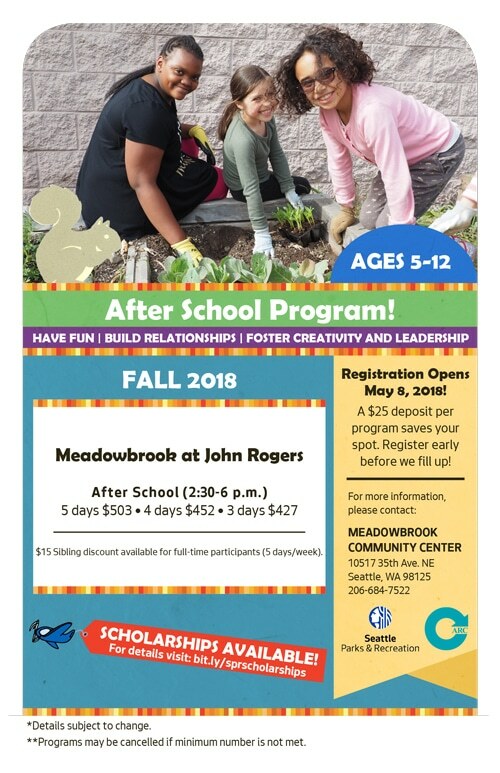 Click HERE for the Fall 2018 John Rogers After School Enrichment Programs through Meadowbrook Community Center. Do you want your child to have fun, engaging opportunities that support continued learning and personal growth outside of school? The focus of our program is to provide children with opportunities to develop socially, emotionally and physically. The atmosphere at our program is one that emphasizes community relationships, but also recognizes individual achievement, creativity and original thinking. We make it our mission to promote self-awareness, self-control, conflict resolutions skills and positive decision-making abilities. We like to work in partnership with our local schools to make sure your child’s educational experience is constantly being enriched. Our trained staff works daily to offer activities in areas such as: arts and culture, environmental stewardship, health and fitness, academic support and more. Scholarships are available. Please visit your local community center or the scholarship webpage for more information. DSHS child care subsidies are also accepted. Participation requires submittal of the appropriate waiver forms PRIOR to the start of the program, including the medical release form (E-13) which can be found here. If you have a child with special needs (e.g. asthma, allergies, etc.) and/or disabilities, there will be additional forms to be completed. Additional forms can be found on the Seattle Parks and Recreation site here (see the right sidebar of the page.